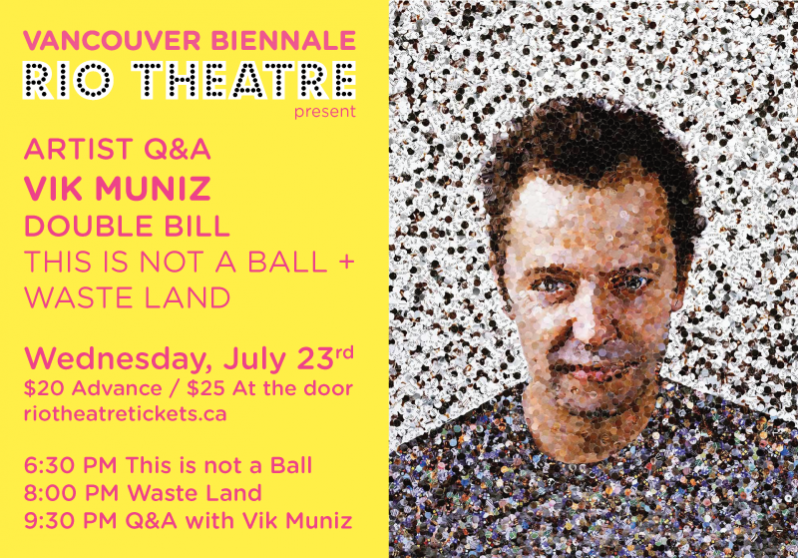 Join us on Wednesday, July 23rd as the Rio Theatre and Vancouver Biennale present the Canadian premiere of celebrated artist Vik Muniz’s latest documentary This is Not a Ball and a screening of his Academy-Award nominated Waste Land. See how Muniz transforms unconventional materials into art and participate in a rare chance to join him in conversation. Waste Land, the Sundance Film Festival winner and Academy Award-nominated documentary chronicles Muniz’s work at a Brazilian junkyard located in the outskirts of Rio de Janeiro. Working from photographs of the impoverished local garbage-pickers, Muniz creates grand scale mosaic portraits by repurposing junkyard scraps. His collaboration with the pickers reveals their essential dignity and humanity through art. This Is Not a Ball is the Canadian premiere of Muniz’s directorial debut, which chronicles the creation of a massive new artwork using 20,000 soccer balls in the lead-up to the FIFA World Cup 2014. The documentary follows Muniz as he explores the global passion for soccer. In his journey, Muniz uncovers a network of intriguing people and stories, with subjects ranging from sports to astrophysics, gender politics and history.